Michael Kenji "Mike" Shinoda LHD is an American musician, record producer, and artist. He co-founded Linkin Park in 1996 and is the band's rhythm guitarist, songwriter, keyboardist, and co-vocalist. 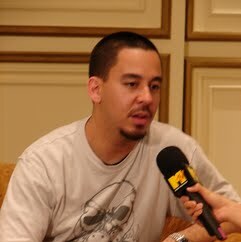 Shinoda later created a hip hop-driven side project, Fort Minor, in 2003. He served as a producer for tracks and albums by Lupe Fiasco, Styles of Beyond, and The X-Ecutioners. Shinoda is also the co-founder of Machine Shop Recordings, a California-based record label. Outside of music, Shinoda is an artist and graphic designer. He has painted several pieces of artwork, some of which have been featured in the Japanese American National Museum.